Recent Press Release from Santa Cruz Media, the owner of rights Fr. Corapi’s products. Read it here. It’s difficult to excerpt, but it should be read. I also heard from a reliable source he’s been suspended from EWTN pending investigation. 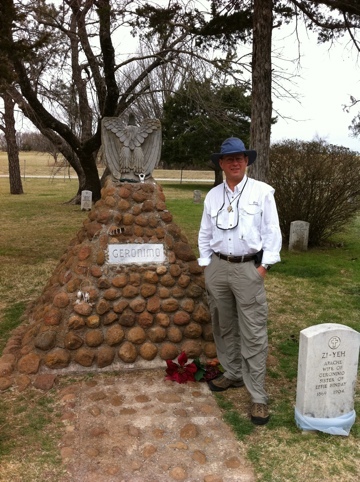 At Geronimo’s grave in Fort Sill Oklahoma. He was always a childhood hero of mine. When I galloped around the woods and fields on my horse as a kid I always pretended I was Geronimo! Thanks to Fr. Fukes, military chaplain here, I got a tour of Fort Sills and got to visit the graves of the Apaches brought here as prisoners to Oklahoma. I was interested to see Christian crosses on their tombstones. Geronimo converted to Christianity. His nickname “Geronimo” came from the Mexicans who called out in prayer to St. Jerome (Geronimo) when battling against him. More on him later. I am Lawton Oklahoma giving a parish mission and speaking at the Catholic school. Great folks here at Holy Family parish –a beautiful church to.